There seem to be two schools of thought around councils and roads authorities providing bike lanes; one is to treat them like precocious toddlers, lavish praise on anything they do no matter how ineffectual or useless, the other is to praise the good and call them out on the bad or just plain dangerous. A few too many people seem to lean too far to the former, sighing and flapping their hands and exclaiming “Well it’s better than nothing.” Well often it is not better than nothing, and sometimes it is even worse. 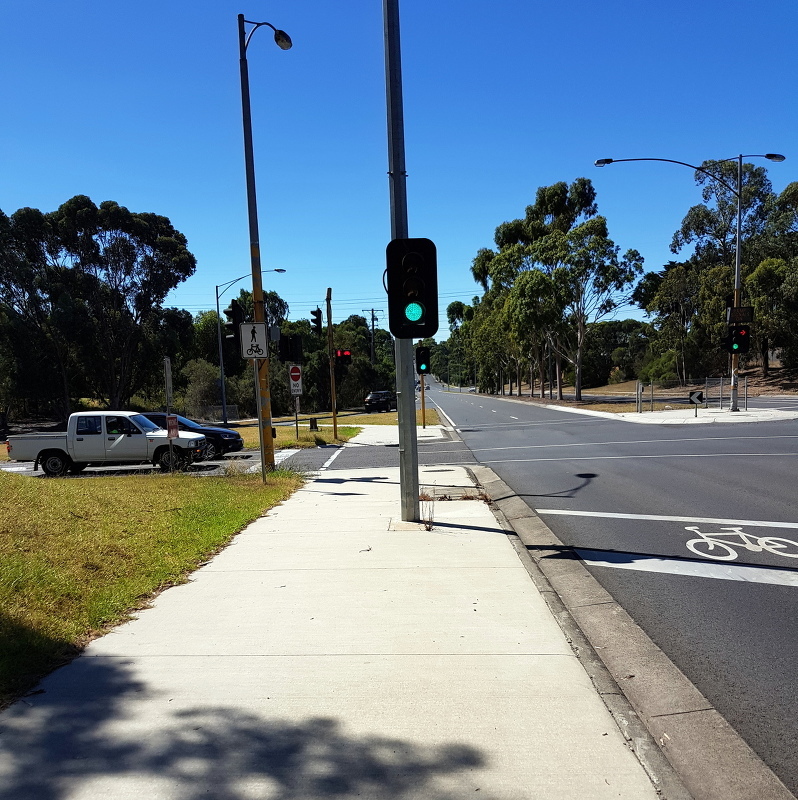 For far too many years I’ve ridden up and down Gardiner and Forster roads, heading north from Monash University, and for far too many years I’ve watched as a bizarre piecemeal mix of useful, not-useful, and sometimes dangerous bike lanes are built. 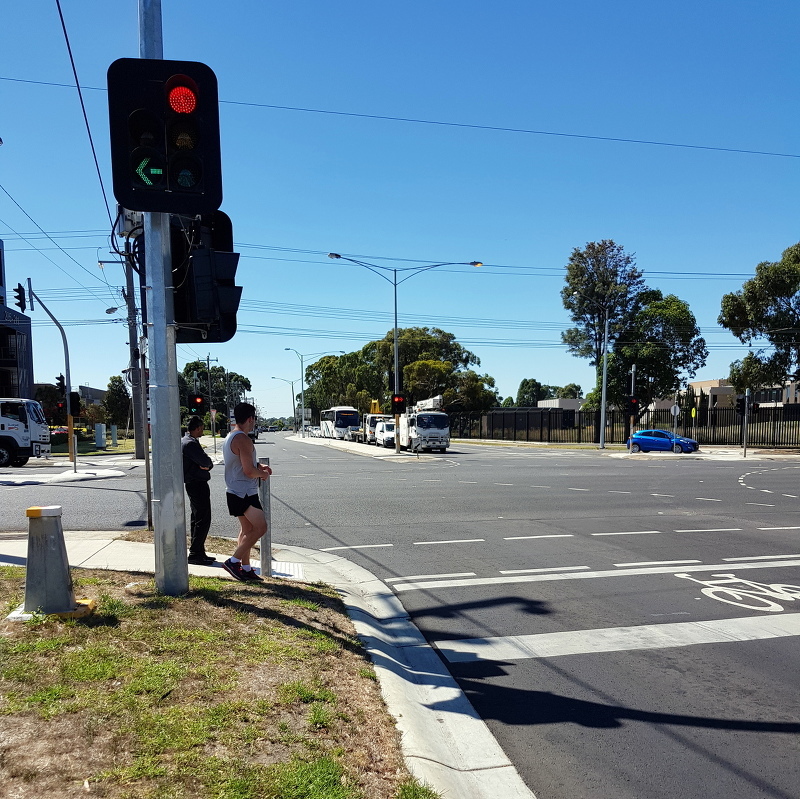 The current set has been in place for some months now, following the latest rebuilding of the main intersection and set of traffic lights where Gardiner road crosses Ferntree Gully road and becomes Forster road. I’ve been meaning to take some photos for a while, today I got around to it. Leaving the University along Bayview avenue are many cyclists, there is no bike lane, they have to contend with an even larger number of motorists, and anyone wanting to head north has to turn right across the traffic and into Gardiner road. Again, Gardiner road has no bike lane…. Then after the first side street a bike lane appears, but so that this doesn’t inconvenience local residents and business too much, motorists are allowed to park in it for 21 hours of the day. It’s only from 15:00-18:00 that no stopping is allowed – although the local council doesn’t seem to enforce it that often, and especially up near the pub there are nearly always customers parked in it. So sometimes you can ride in the bike lane, but often you’re forced back out and into traffic. As usually happens in Melbourne, the bike lane then vanishes 50m from the major intersection so that extra lanes can be squeezed in, this is doubly hazardous since first there’s no more bike lane, and second the addition of the second lane makes both narrower so cyclists are more likely to be squeezed off the road. 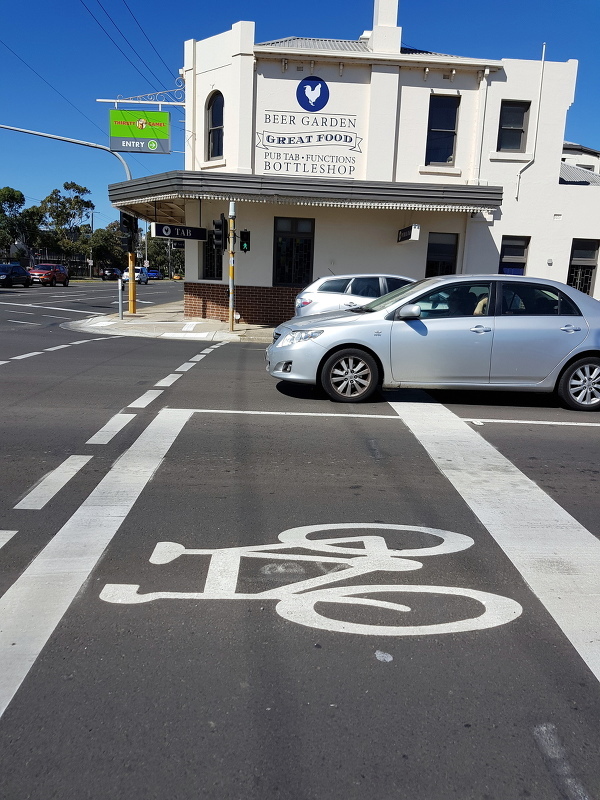 Miraculously, a “Forward Bike Box” has been incorporated at the newly revamped traffic lights, but two factors stand out and make it apparent that it isn’t part of any well thought out plan. The second of these is an inconvenience, the first is downright dangerous and I’ve been hit by motorists – twice – as a result. If you’re approaching the lights and they’re green you see a single green light, and no turning arrows. If the light goes amber then cyclists stop in the forward bike box. The light then goes red, but immediately the left-turn arrow lights up green! This has the effect that any motorist behind who was intending to turn will just keep on driving, and because of the “Forward Bike Box” enticing cyclists to stop further out in the lane, they run the risk of either being abused “for being in the way” or simply run into by turning motorists. The second problem with the “Forward Bike Box” isn’t so dangerous, but just illustrates the lack of thought that went into the whole design. At the intersection there are three lanes for traffic heading north up Gardiner road; two lanes continue straight ahead into Forster road, the third turns right into Ferntree Gully road. For some bizarre reason the bike box extends across both lanes that go straight, but not the right-turn lane. I can’t see any reason why there’d ever be enough cyclists there to ever warrant there being cyclists in both straight-ahead lanes, but anyone wanting to turn right is forced to sit back, squeezed between two lanes of cars. 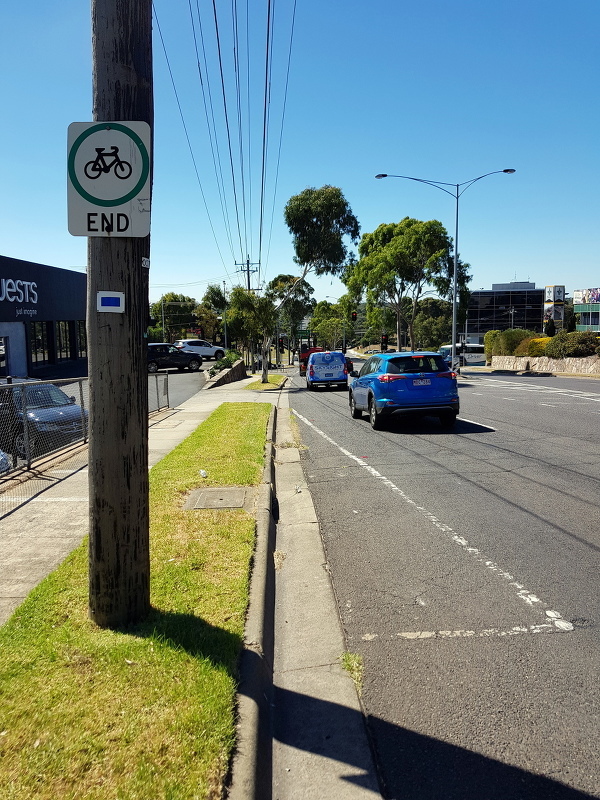 Once you’ve survived the traffic lights and continue north on Forster road you find that there’s still no bike lane, but the angle and changing width of the lanes means that many drivers squeeze you towards the gutter. 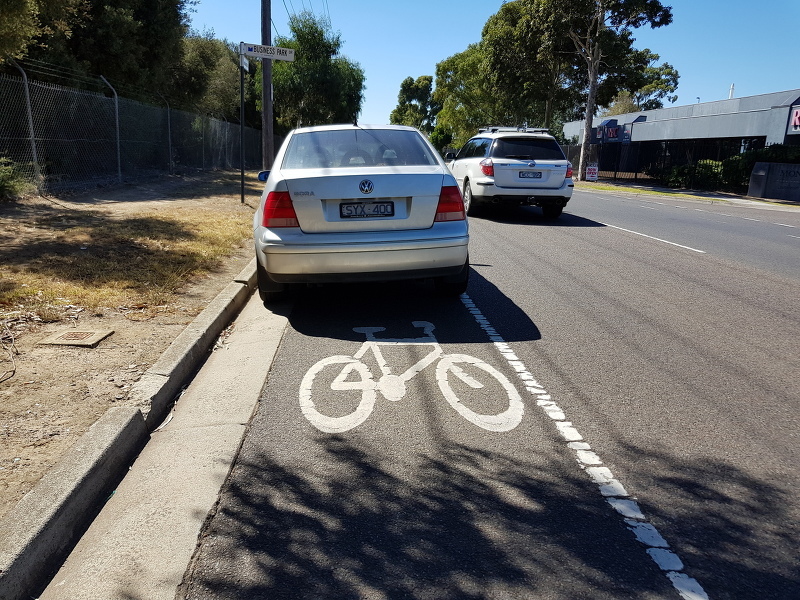 Then a bike lane reappears, but only for another few hundred metres, once again it vanishes, this time before the traffic lights for Hardner road. Depending on the width of the vehicles and their placement in the lane, sometimes you can ride up to the lights alongside and sometimes you can’t. An added hazard here is that a large percentage of the motor traffic will be turning left onto the freeway on-ramp just after these traffic lights, but any cyclists will want to be going straight ahead. Once the lights go green it seems that the majority of drivers have a mindset that insists they get ahead of the cyclist then turn left, rather than turn in behind, even if they are behind the cyclists to start with. This leads to a fair number of “left-hook” near misses. Finally, at the freeway itself there are two sets of traffic lights to handle traffic turning right onto and off the freeway. At both of these there are forward bike boxes, and miraculously, there’s now an off-road bike path that suddenly appears. The only visible way of getting onto it is to dismount and walk across a pedestrian crossing, or lift your bike up the kerb. The off-road path looks almost ideal, if only it extended past the confines of the freeway intersection, but VicRoads has conspired even more to dissuade cyclists from using it. The traffic light for the off-road path is separate from the light for Forster road, and does not change to green unless someone has pushed the beg-button. This means that if two cyclists approach the intersection when the traffic light is green; one on the road and one on the path, the cyclist on the road can ride straight through while the one on the path has to stop, press the button, wait a full cycle of the lights to then ride up to the second set of lights, push the button, wait a second cycle of the lights, then finally proceed through the intersection! Oh, and then the off-road path unceremoniously ends, dumping them onto the freeway slip-lane heading back onto Forster road. Is it really any wonder that cyclists don’t use that path, or those that do ride through when the road set of traffic lights show green. Another hundred metres or so of bike lane and I’m finally rid of this mess and I can turn off onto the Scotchman’s Creek path. The off-road path has its own set of curiousities, but I don’t think anything can match these disjointed poorly integrated haphazard bits of bike lane. I might be prepared to laugh and forgive them if they’d built them thirty years ago in the 1980s, but most of this mess has been built in the last year. 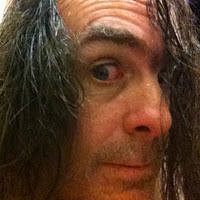 VicRoads, local councils, this just is not good enough.